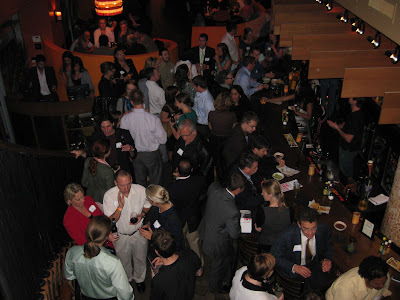 Each year the European-American Chamber of Commerce (EACC) hosts happy hour events throughout the year where 20-35 year-olds come together and connect with European culture in a social atmosphere. The first of these happy hours in 2010 will take place Thursday, January 28 at The Celestial restaurant in Mt. Adams. The social event will take place from 5:30pm to 7:30pm and feature drink specials on beer, wine, and cocktails between $2.75 and $4. Discounted appetizer specials will range from $4.50 to $9 and include Rock Shrimp Gnocchi, Perigord Foie Gras, Krabby Patties, Duck and Sweet Corn Relleno, Sauté of Bay Scallops, Celestial Baked Virginia Oysters, and Mushroom Napoleon. In the past the happy hours have drawn around 100 people from all different walks of life. Organization leaders say that it is a great opportunity to meet international people including lots of Europeans as you might expect. "There is no formal expectation and people are really friendly," says Brian Meyers with the EACC. "Both Americans and Europeans are equally welcome, and both represent something exotic and new for the other group." There is no cover charge for this event and those interested in attending do not need to RSVP. The Celestial (map) is located in Cincinnati's famous Mt. Adams neighborhood and offers free parking. EACC YP Happy Hour at Nada photo provided.